Lesson learned: It’s hard to make cooked broccoli look appealing. I consider myself lucky to have a husband who likes cooking and is good at it. We take turns cooking dinner on a weekly basis, and sometimes we argue about whose week it is because we both have recipes picked out that we want to try. But I can’t really get annoyed because my husband is insisting that it’s his turn to cook. Or complain if we eat late because he’s perfecting his pepperoni pan pizza with a home-made crust. Or get grumbly because I have to fit into a dress for a friend’s wedding in a couple of weeks and he made some amazing short ribs and mashed potatoes that I’m having a hard time resisting seconds of. Unfortunately, not whining has never been my strong suit, but honestly, our sharing of dinner duty is a pretty great situation. The only real problem happens if one of us doesn’t check the fridge very well before we go grocery shopping, because sometimes we buy produce that we already have. This is how we ended up with two large bunches of broccoli this past week. 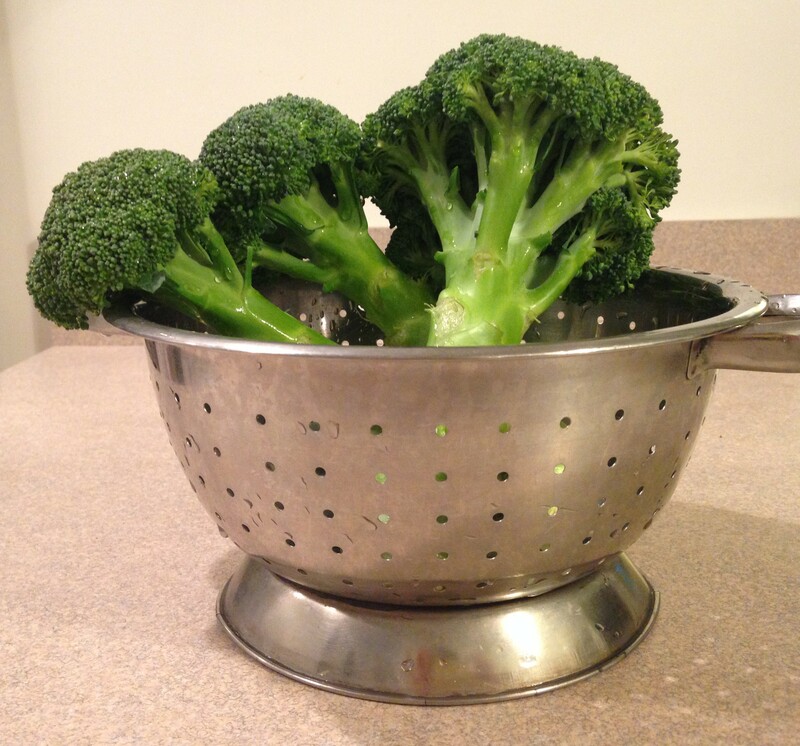 Fortunately, I have a new favorite way to prepare broccoli. I first tried making broccoli like this after having a something similar in a restaurant while traveling over the summer. It was tender but still had some tooth, and it was a little charred—in the good way— in some spots. I think only the florets were served in the restaurant, but in my version, I use the whole broccoli: both the crowns and the stems. I haven’t fully embraced the “crisp-tender” phenomenon for vegetable cooking, because sometimes they still taste raw to me. If I want that sort of flavor, I’ll probably just eat the raw vegetable. And I’ll admit I’m not averse to Southern-style, cooked-til-they’re-army-green vegetables. For this recipe, I wouldn’t call anything crisp, but nothing is mushy. The stems are first cooked separately from (and for significantly longer than) the florets, so that they take on a texture like most any other roasted winter vegetable. The florets are steamed/boiled for a very short time, and then seasoned. I use powdered onion and garlic, which I tend to avoid, but they work well here, plus they’re simple. Smoked paprika is also added, and let’s be honest, smoked paprika makes everything better. It is like the bacon of spices. Finally, everything gets put under the broiler for a few minutes, until the florets get just a little bit blackened. Note: My bunch of broccoli yielded about 1 1/2 cups of stems and 5 cups of florets. You might want to add more or less seasoning and/or olive oil depending on how big your bunch is. Also, I cook the florets in a small amount of water in a covered pan because it’s quick, easy, and there are fewer dishes to wash, but you could also steam them in a steamer basket. 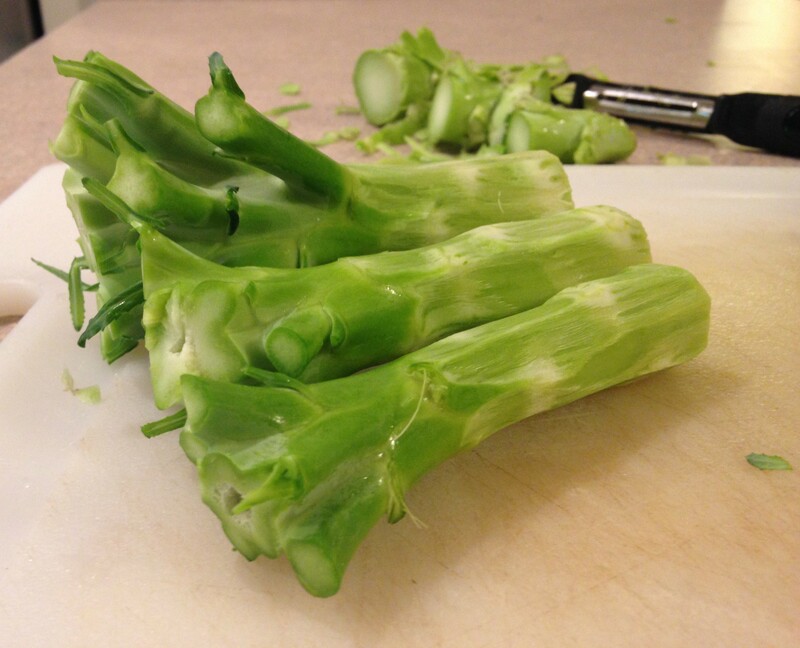 Trim and peel the broccoli stems, then chop into about 1/3″ chunks, discarding any tough or woody pieces. I start cutting from the part of the stem that was closest to the crown, and if I reach a part where my knife stops slicing easily, I don’t use the rest. Toss the chopped stems with 1 Tbsp. of the olive oil and 1/4 tsp. of the kosher salt. Add fresh pepper to taste. Spread onto a baking pan and roast in the middle rack for about 20 minutes, or until nicely browned. Stir every 5 minutes or so. While the stems roast, prepare the broccoli crowns. Cut the crowns into florets. Fill a medium saucepan with water to about 1/2″ depth and bring it to a boil. Add the florets, cover, shake a couple of times, and cook until tender. This will happen very quickly, in only about 3 minutes, maybe fewer if you like your broccoli on the crisper side. 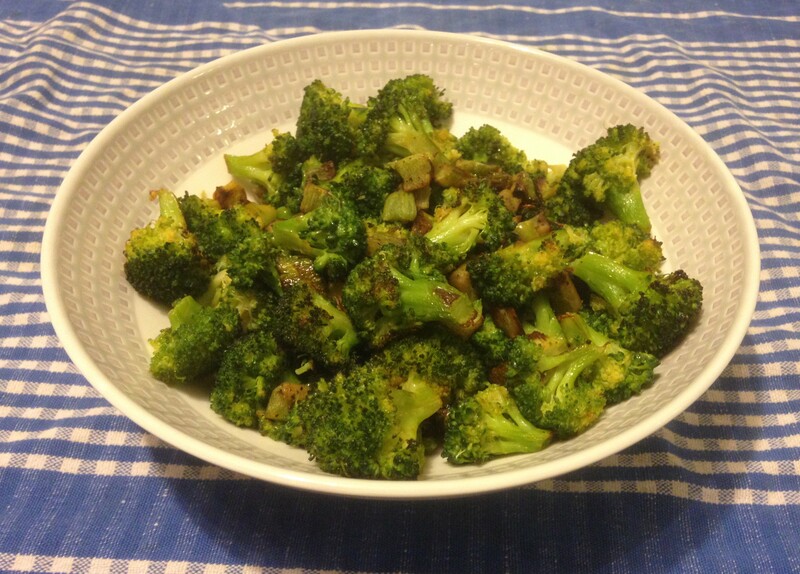 Drain the broccoli well, then place it in a bowl and toss it with the onion powder, garlic powder, smoked paprika, remaining 1 Tbsp. olive oil, and remaining 1/4 tsp. kosher salt. Add freshly ground pepper to taste. After the stems have finished roasting, remove the pan from the oven, crank the heat up to broil, and put a rack directly under the broiler. Spread the seasoned florets in the pan with the stems. Once the broiler has preheated, place the pan back in the oven for a few minutes, until the florets have just started to blacken. This took about 6 minutes in my oven. Remove from the oven and adjust seasoning if needed. Serve hot. We forgot about broccoli so this is a good reminder, thanks! Also, you are not a whiner! Hope you try it and like it! Glad you don’t think I’m a whiner, but there might be some people who would beg to differ! FYI: I love broccoli stem. I often roast brussel sprouts but I have never roasted broccoli. I love to try this dish to enjoy the winter vegetable. Thank you. Me too! Roasted, I actually like the stems better than the florets. I look forward to preparing this broccoli. It sounds yummy! Thanks for sharing.